One of Super Nintendo's most celebrated titles, Contra III: The Alien Wars, is now available for the Wii U's virtual console. 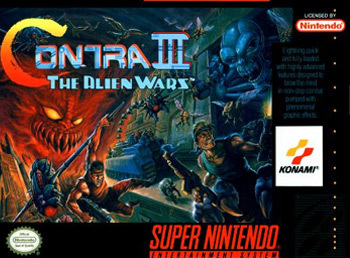 It might not be the system seller that Nintendo is looking for, but Contra III: The Alien Wars has just crash landed on the Wii U eShop. Those of you who remember the 1990s are undoubtedly familiar with The Alien Wars. It was one of the most highly regarded games on the Super Nintendo, and its name is still spoken with reverence among pot-bellied gaming classicists. Since its release in 1992, Contra III has made its way to the Game Boy Advance and the Wii Virtual Console. So, its appearance on the Wii U's eShop isn't entirely surprising. Plus, the holidays are here and Nintendo needs money. If you're interested in purchasing your very own copy of The Alien Wars, you'll need to fork over $7.99. However, if you already own a copy of the Wii edition, you'll only have to pay $1.50 for the upgrade. It's been two years since Konami has released a Contra sequel (and that one didn't even have the word Contra in the title), but the developer recently filed a trademark application for Contra Run and Gun. So, keep your fingers crossed. Actually, just use your fingers to play Contra III: The Alien Wars. You'll be happier.